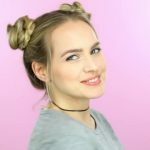 Hey everyone, Kayley here with a week of bun hairstyles. I have planned your entire week of hair just for you. 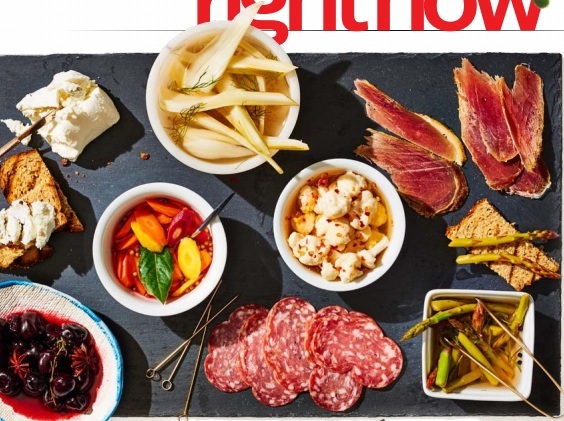 They all feature buns and they can all be done in less than minutes. Hope you enjoy, let’s get started. For Monday, we are gonna do a quick but cute messy bun. 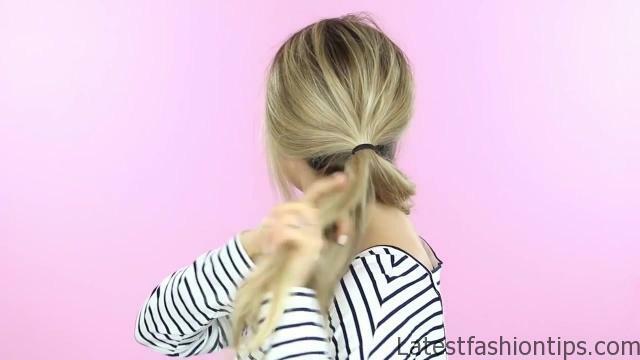 Start by pulling your hair into a low ponytail and then use your fingers to kind of mess up the hair at the base of your ponytail so this looks like a nice, messy hairstyle. You can also pull out some little pieces around your face to frame it. 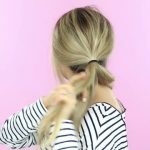 To create this messy bun, you are just going to grab a piece of hair from your ponytail, split it into two and then wrap those two halves around each other. 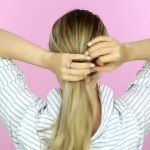 Once you get to the end, grab a little piece at the end of your hair and grab the rest of your twist with your other hand. Slide that hand all the way up till you hit your ponytail holder then use that little bunch of hair to create your nice, messy bun. Just gonna put this against my head and then pin it in place then go ahead and do that with as many sections of hair as you like. Keep in mind, the more sections you do, the bigger this bun will be. 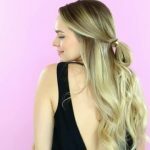 Make sure to pin all the bunches of hair close together so that it looks like one bun and if you have any little crazy flyaways sticking out, pin those down with some bobby pins. Finally, I pulled everything together with this headband which you actually tie around your head. So I just tied it around and tied it in a knot. Of course, you could replicate this with any headband that you love. And that’s it for Monday. 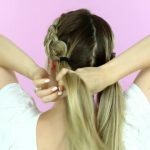 This hairstyle should give you a couple extra minutes of sleep while still keeping your hair super cute. And now let’s move on to Tuesday. 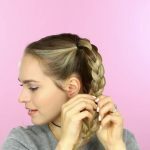 For this, you are just gonna start by taking a section of hair from the crown of your head and splitting it into three and then I did an inside out French braid which is basically when you braid under the middle strand rather than over. That creates this D look. So you just start braiding under and then you start adding in hair until all of your hair is in this inside out French braid. 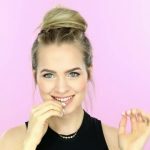 Once everything is braided, you are ready for your messy bun. This is what I call the double loop messy bun. You’re gonna put a ponytail holder onto your hair, loop it through once and then switch your little ponytail holder around and loop it through again then I just pull everything apart and it creates this really cool messy bun. 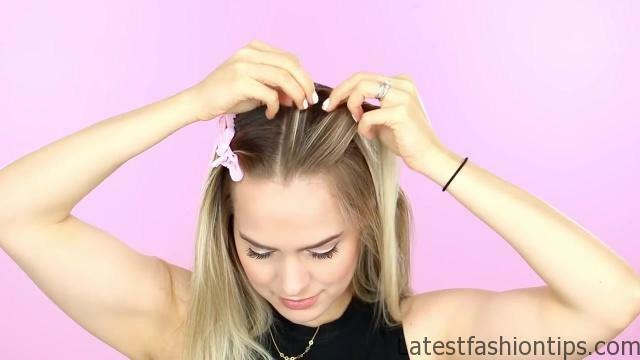 And if you want, you can pin a couple of sections against your head, even pin away some flyaways. The final thing I’m gonna do for this hairstyle is to pull apart the braid just to make sure that it is nice and full and statementy. And that’s it for this hairstyle. 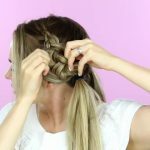 You can do it in just a couple of minutes and be out the door with this girly bohemian hairstyle. For Wednesday, we are gonna get just a little bit more polished. 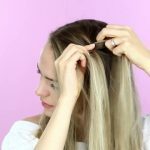 All you have to do is pull your hair into a low ponytail and on your very last loop, just pull part of your hair through so that it creates a loop as well then you are gonna take the rest of your hair and wrap it around the band of your elastic. It should be nice and thick so that it creates this cool, kind of knotted look to the hairstyle. Once you have got it wrapped around, use a couple bobby pins to hold that in place. I finished it off by adding some hair spray to make sure that everything stayed in place throughout the day and that is it for this hairstyle. This would be amazing on wet or damp hair. 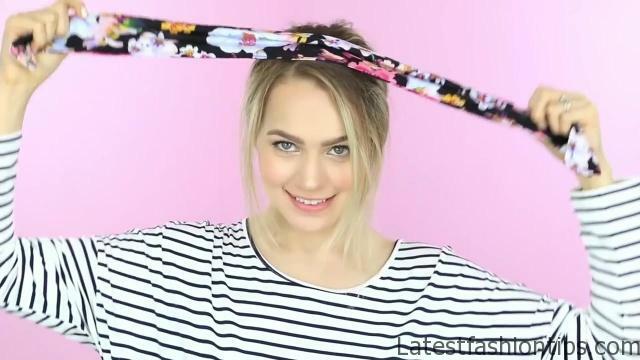 So if you didn’t have time to dry your hair, pull out this hairstyle. It will be perfect. So for Thursday, I went a little out of my box and did these double buns which I actually used to wear in the late s but I wore them with scrunchies which I do not really think helps the look at all. You decide. Anyway, let’s see how to wear them today. We’re gonna make these two high buns first by making two high pigtails. You wanna make sure they are about the same height so that everything ends up being pretty even then for the bun, you are just going to braid all the way down your hair and secure it with an elastic then massage the braid to loosen it up. This will also help the bun to be a tiny bit bigger and more relaxed looking. Now, all you have to do is wrap it around and pin it in place. Now, just repeat the exact same thing on the other side. And that’s it for these buns. I’m actually super into them and I think they are great for an outdoor or exercise hairstyle. We’re already to Friday. It’s just gonna be two braids and a bun for this one. You’re gonna start by making a rectangular section on top of your head. 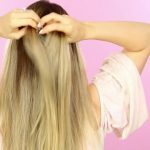 You want it to be right to the side of your center part and then clip the hair on either side of that rectangular section out of the way. 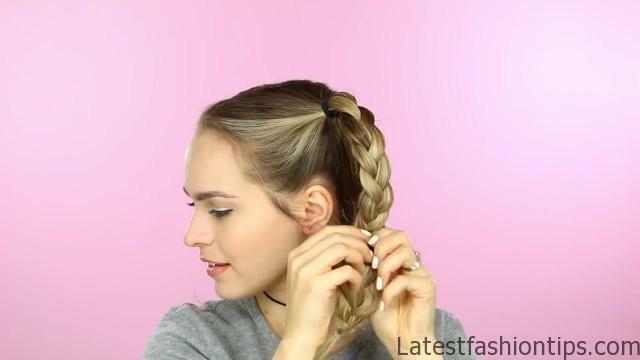 Now, you are just gonna do another inside out French braid so you are just going to braid under the middle section and bring in more hair as you braid. 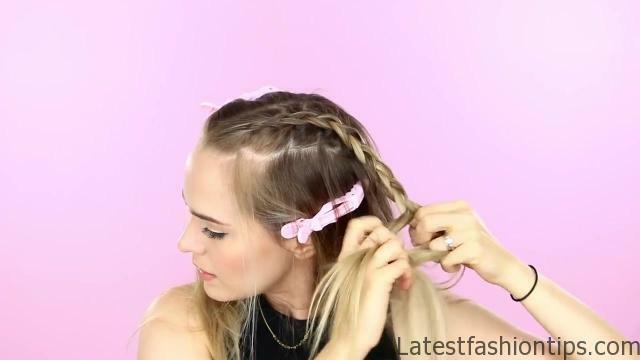 You’re gonna take tiny, tiny sections as you do this so you can get a really cool looking braid going back. This might seem a little daunting the first time you do it but once you get the hang of it, you can do it super quickly. 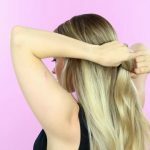 Once you have braided all the hair in the rectangle, you can braid a couple more inches normally and then secure it with a bobby pin. Now, make a similar rectangle on the other side of your part and do another braid the exact same way. My little tip to you is to actually tilt your head back while you do this so that gravity helps you. It makes the whole braiding process way easier. And now you are ready to pull everything into a high ponytail, as high as you can and then secure that with an elastic. I’m gonna do my favorite top knot first by backcombing with my brush to create kind of a light, fluffy tease. I’m going to twist my hair very loosely and then wrap it into the shape of a bun. 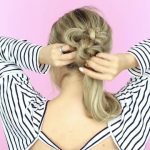 Once you have done that, you can pin everything in place and this hairstyle is done. And that’s it for this bun. 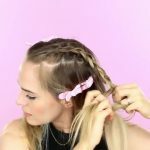 It is perfect for the end of the week because you could do it on dirty hair and no one would ever be able to tellcause of these braids. I thought for Saturday, a half up, half down style was perfect. I brushed my hair to make it a bit smoother on top and then I just went ahead and took the top half of my hair and swept it back and pulled it together with an elastic. 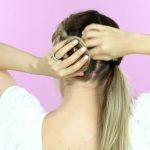 On the very last loop of your elastic, only pull your hair part of the way through and we are gonna create a little chignon that way. To finish it off, I grab this little cuff from Scunci. 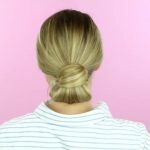 This bends really easily around any size ponytail so I just bent it around the elastic around the chignon and that is it for this hairstyle. I like the extra little bling that the cuff adds and this hairstyle comes together so quickly and so easily. For Sunday, I decided to get a little fancy. We’re gonna be making two pigtails. The first one is going to have a braid. 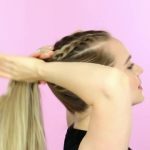 To make the braid, just take a section of hair from right next to your part and either do a French braid or an inside out French braid like we have been doing throughout the video. You’re just going to braid basically the hair over your ear. You can leave out a little bit around your face if you want. 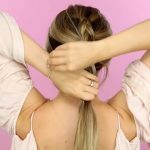 And once this braid is about four to five inches long, you can switch to braiding normally for a few more inches. Now, just split your hair in half and make a pigtail with the braided side of your hair and that is pigtail number one. If you want, you can also pull apart and massage the braids so that it is nice and big and statementy and now for pigtail number two. You’re just going to twist all of that hair back and continue twisting until you reach where your pigtail is going to sit then just gather everything together with the hair elastic and that is pigtail number two done. The bun is a lot like Monday’s hairstyle. 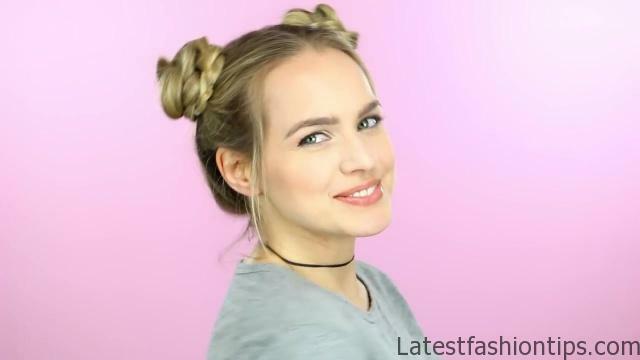 You’re gonna wrap two pieces of hair around each other but this time, we are only gonna slide the twist up just a little bit then just pull apart the little scrunched up twists a little bit and you can see that you get this cool bubbly look but it is not gonna be as messy as Monday’s hairstyle. 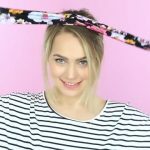 Once you have got that the way you want it, just wrap it around into the shape of a bun and you can see this really cool looped bun look coming out. Now, just repeat the same thing with the other pigtail. As with Monday’s hairstyle, you want to get these two buns so close together that they look like one big bun and not two different ones. I finished this off by adding in just a couple of fake flowerscause I thought it was pretty and that is it for this hairstyle. This is obviously super girly and you can wear it without the flowers for brunch or a farmersmarket but you could also use this for any weddings that you have coming up soon. And that’s it for this full week of bun hairstyles. 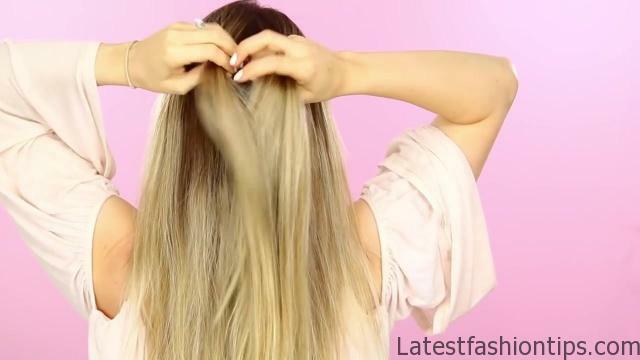 I hope you guys have enjoyed it and I definitely hope you try them out because they are quick and easy but you will look cute every single day. 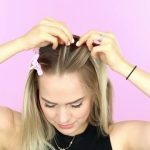 Make sure to subscribe for more hairstyle tutorials for real life and I will see you in my next video. Bye.